Our choice of chat clients nowadays is huge. Chatting has left the desktop behind and expanded onto mobile in a big way. These days, everyone is getting in on the act. Recent research revealed that chat apps will account for double the traffic of traditional text messages by the end of the year. Most messaging apps now offer a host of additional features to try and reel you in. Expanding beyond the basic one-on-one text chat, with real-time updates now a standard, we can have group conversations with audio or video, share files, and even consume content together and just hang out. In the past, the undisputed heavyweight of mobile chat was BBM. 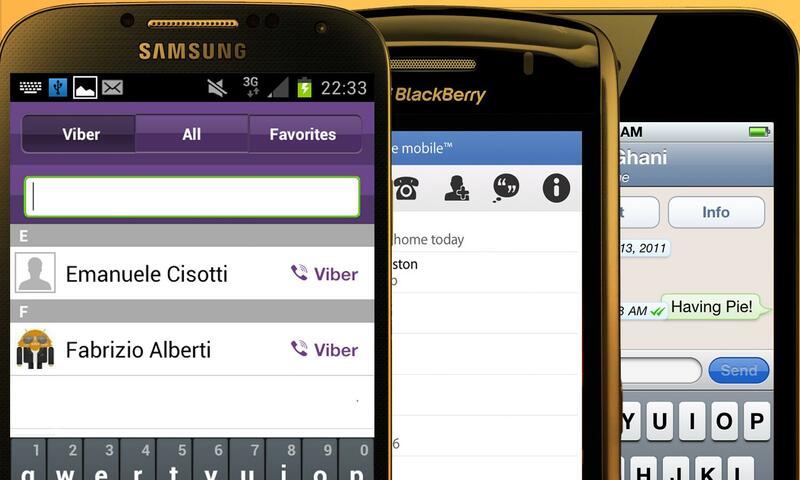 A killer feature for the brand, BlackBerry Messenger is now coming to Android and iOS. The trouble is, it has been cloned and built upon already. We’re spoiled for choice, but what makes a good chat app? What elevates one messaging app above another? That’s the question of the day and we’re going to have a bit of a chat app showdown and see if we can’t sort this thing out. With a focus on text chat, WhatsApp is accessible and very easy to use. You can avoid incurring any SMS charges as long as you convince your friends to install the app, too. The iPhone app costs $1 and on all other supported platforms you get a one year free trial, after which it costs $1 per year for a subscription. You can share audio files, photos, videos, contacts, and your current location through WhatsApp, but it lacks support for voice or video calls and there’s no presence on the desktop … yet. This cross-platform mobile messenger app has really taken off in recent years. WhastApp was founded in 2009 by a couple of ex-Yahoo! employees aiming to build a better SMS alternative. The CEO let slip recently that the service handles 20 billion messages a day and described it as “Bigger than Twitter.” There was brief talk of a Google acquisition, but it remains independent for the moment. It’s big enough to claim verb status, but is Skype still primarily used for cheap international VoIP and video calls with family abroad? Microsoft is certainly looking to push it into our living room, with support on the new Xbox One and a growing presence on Smart TVs. A lot of people use it on mobile as well, and it supports instant messaging and group chats with hundreds of contacts simultaneously. Skype is the messaging app to beat. However, is it too feature-rich to be accessible? The last time Microsoft mentioned a specific figure, in the Earnings Release FY13 Q1, back in October 2012, the Skype service had 280 million users. It has remained near the top of the Android charts since then and we can be confident it has racked up a few downloads on other platforms as well. Microsoft also acquired GroupMe, which is a group chat client for smartphones, and you’d expect it to be folded in to Skype to improve the mobile experience at some point in the future. It used to be a powerful draw for the BlackBerry platform and it was the first major chat client on mobile to offer real-time read receipts, so that you knew if the other person had read your message, even if they didn’t reply. 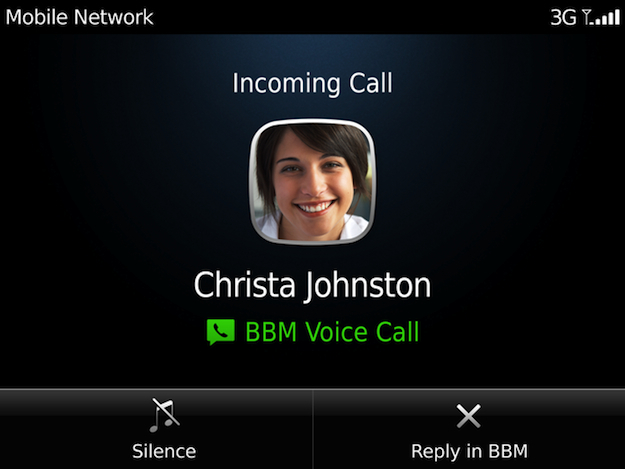 The functionality has gradually been emulated by alternative services, but BBM was significantly beefed up with the release of BB10 and remains very accessible and robust. The service could grow more enticing with the launch of BBM channels. BlackBerry recently admitted that BBM users are in decline, down to 55 million from a high of 75 million. Perhaps that’s part of the reason that it’s finally opened up to other platforms. There are no plans for a Windows Phone version, as BlackBerry and Microsoft fight it out for third place in mobile, but a desktop client could be a smart move for the future. Apple’s messaging app didn’t appear until the end of 2011, but in typical Apple style it is a fully-integrated solution that just works. 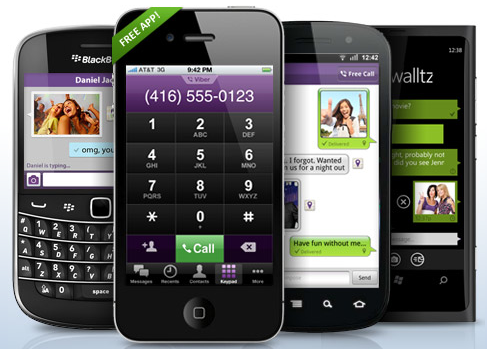 It replaces SMS where appropriate and saves users from text messages charges. It’s slick, accessible, and (when you combine it with FaceTime for voice and video calls) feature-packed, but (and it’s a big but) you can only use it on iOS or Mac OS X. If you and all your friends are Apple people, then perfect. If not, you’ll have to go beyond these apps to keep in touch. 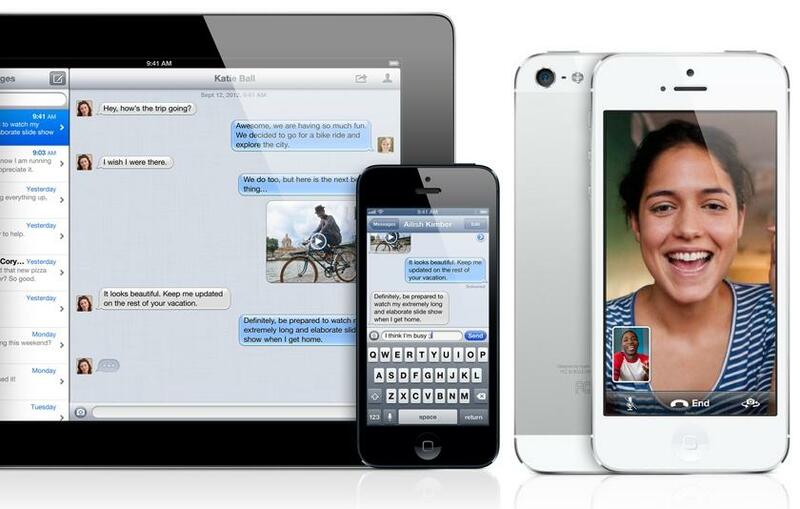 Back in January we heard that iMessage was handling 2 billion messages every day. We expect Apple to roll out new features for iMessage and FaceTime in the coming months, probably in concert with the next version of iOS. With such a healthy user base on the platform it will continue to grow, but we can’t see Apple extending it beyond its own products, so it will never have the appeal of a cross-platform service. 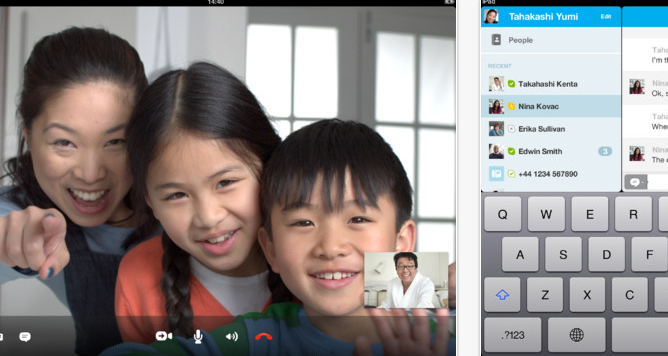 For group text or video chat, Hangouts is ideal. It also works well for broadcasts, which is why a lot of websites and organizations seem to be using it as a way to run shows with audience participation. On the other hand, there are some gaps in its integration with other Google services, and there’s no built-in location sharing option. It has a pretty barebones look, in keeping with Google’s style, and it’s very easy to use. It’s not clear how popular Hangouts is, but Google recently mentioned that Google+ has 100 million active monthly users, so we’re guessing somewhere below that figure. Google has been consolidating services and folding everything together under the Google+ banner with your single Google sign-in. 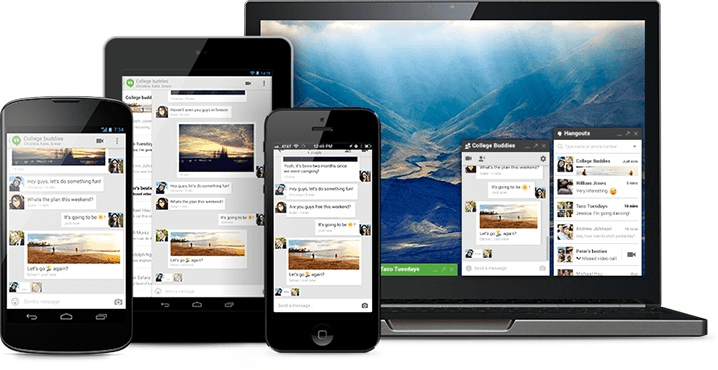 Hangouts is brand new and it replaces Google Talk. We’ve been assured that Google Voice support is coming and so is SMS support, so it will obviously be improved over time. 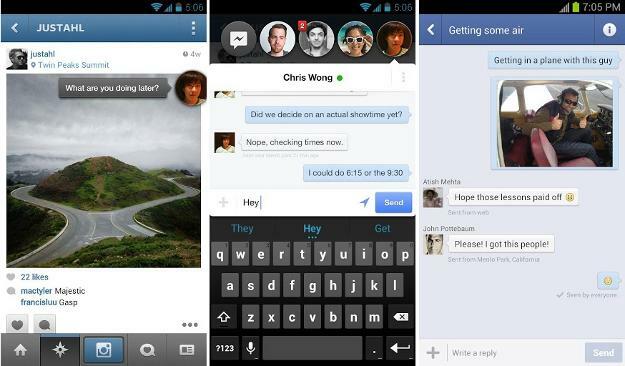 Messaging has been a weak link for Android, could Hangouts be the cure? We think possibly. There’s no denying the popularity of Facebook and this simple messaging system is built-in to the website. You can also get standalone apps for a better chat experience on your smartphone or desktop. Facebook recently added Chat Heads, announced alongside Facebook Home. It’s a clever idea; essentially, it allows friends and family to chat to you without you having to leave the app you are in. The Chat Heads pop-up, superimposed over whatever you are doing. The Chat Heads feature has a full range of Facebook Messenger functionality (including voice calls), but is not available across the board, in terms of countries or platforms, though we expect it will be soon. An active user base of over 1 billion people is helpful for any launch. Facebook claims over 750 million active mobile users and a portion of them use Facebook Messenger. How many, or how often, is simply not clear. Facebook acquired Beluga to form the basis of its messaging service and the addition of Chat Heads shows that it’s still evolving and improving. The clever thing about Viber is that your ID is simply your number, so there’s no hassle creating an account or adding contacts. If you call or text someone and they use Viber it will be free, if they don’t then it will revert to your usual call or text allowance. Video calls are new to Viber and they only work on the desktop client right now. As it stands, Viber is free and there are no ads, but apparently it’s not profitable and it’s a safe bet that some kind of monetization plan is waiting down the line. Right now, it’s growing fast and improving all the time, and it’s well placed to be a major contender. It offers a good balance of features and cross platform support, but we don’t know what the future holds. This is far from an exhaustive list, but these are some of the biggest names in chat right now. There is room for a lot of smaller competitors, and some niche apps that focus on specific features, such as Snapchat, which is focused on photo sharing. Other honorable mentions go to Kik, IMO.IM, Palringo, and Trillian. There are some other seriously big players if you look to the East, most notably the Chinese, WeChat service, which has over 300 million users. The battle for chat supremacy is far from over. Can BBM make gains in this space? Does Facebook have an unbeatable advantage with that towering user base? Can Google persuade people to use Hangouts? Will successful apps like WhatsApp and Viber inevitably get gobbled up, and can they turn those big user numbers into profit without alienating people? We’re not sure what the future holds, but game on!